Do Americans have too little confidence in government or do they have, perhaps, too much? What types of political protest suit a democratic society? These questions matter to citizens as well as to social scientists, particularly when so many of us have become cynical about politics. 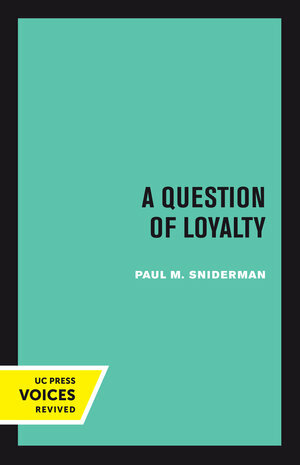 A Question of Loyalty attempts to answer these questions from the evidence provided by a specially designed survey to measure political alienation and political protest. Citizens can make two kinds of errors: they can be over-ready to yield to authority or over-ready to contest it. This study shows one way to tell who has too much faith in government and who has too little. How citizens think about authority—whether their evaluation of government is balanced or one-sided—matters in a democratic society. And demonstrating just how it matters, how it affects not only what citizens believe but what they actually do, is the object of this book. We are in the habit of thinking that a loss of citizen confidence weakens a democratic society, whereas unbounded trust in government bolsters it. But the quality of citizens’ judgment matters, too. Depending on whether their evaluation of government is balanced or not, citizens who are allegiant may threaten and those who are alienated may strengthen the spirit of democratic politics. Paul M. Sniderman is Fairleigh S. Dickinson, Jr. Professor in Public Policy at Stanford University and a senior fellow at the Hoover Institution.